← When Will We Know About Greg Oden? b. I want to talk about the other big story. The other big story is about point shaving in the NBA. No, I don’t want to comment on the NBA’s referee scandal, which has already been reviewed in this forum. Today I want to talk about a study by an undergraduate at Stanford University. On Thursday I received an e-mail from Henry Abbott of ESPN’s TrueHoop. Henry wanted to know if I could review a study by Jonathan Gibbs, a 22 year-old graduate of Stanford University. a. this paper is written by an undergraduate. Stanford is a great school, but undergraduates typically don’t do research that can be published in peer reviewed journals. b. even if this paper is good enough to be published, right now it isn’t. c. even if this paper has been published, can we really believe this study? After all, does anyone believe that gamblers can convince today’s rich athletes to cheat? Having read the paper over – and having talked to Henry – my reaction changed a bit. First of all, this is a well-done study. Gibbs has managed to replicate a wonderful study by Justin Wolfers examining point shaving in the NCAA. And replicate is the key word. The Wolfers study provided Gibbs with a road map to follow in his analysis of the NBA. As anyone who has taken a trip knows, it’s always helpful to have a map. With the Wolfers methodology in hand, Gibbs proceeded to analyze the NBA. Much to his surprise (as revealed in an interview with Henry Abbott published today), Gibbs found market inefficiencies with respect to games where the point spread was large. When the point spread is “small”, Gibbs found that the gambling market is quite efficient. But when the point spread is larger, one could win money by betting against the favorite. Here is what I told Henry (as quoted in his story at TrueHoop). In sum, I think Gibbs found something. Unfortunately his work does not name names. And I am not even sure if he could go through the data and implicate anyone. He has found something in the data that suggests that point-shaving is a possibility. In talking with Henry I noted that NBA players tend to be quite rich. Henry, though, said that there are players who manage to spend more money than they make. This happens because many players are supporting a large contingent of friends and families. So although one suspects that players do not have a financial incentive to shave points, Henry says it’s possible that the large salaries in the NBA do not fully capture the players’ financial incentives. Having thought about this for a few days, I am really not sure what policy this study suggests the NBA should follow. Again, there is no naming of names. Without knowing who is doing this, what can the NBA do to stop it? My sense is that the NBA – if they choose to react – will simply dismiss this study. As I noted in discussing the referee scandal, the NBA is not in the “truth” business. The NBA is in the entertainment business. The easiest path for the NBA to follow is to dismiss this study as so-much academic mumbo-jumbo, and continue to go about its business. Of course if we ever do find that a player or players has been implicated, then the NBA will change its tune. And we can all say “see, we told you something was going on.” Not sure being able to say “I told you so” is much to look forward to. But it’s something. Let me close by recommending the two stories Henry Abbott posted on this today. 14 Responses to "Point Shaving in the NBA"
If I understand this right, basically the deal is that the point spreads are remarkably accurate except when it comes to large-spread games where we find taht the favorites underachieve appreciably more often than they overachieve wrt the spread. 1) Aren’t the teams well aware of the spread before the games start? I mean, it’s not a secret even if they players don’t bet themselves. The conclusions of the study assume the favorites care deeply about achieving (at least) the spread. I’m wondering if those games where the favorite really whups the big spread is more due to some player getting unusually hot or if there might be just more bad blood between the teams, inspiring full effort the whole game through. 2) Playoffs. I’m suggesting one reasonable explanation for teams underachieving more often the big spread games is because they just don’t care as much during the regular season. It’s a long grind and who cares about making the spread on any individual game? A win’s a win, save your energy for the playoffs. So if this trend is strong during playoff games (perhaps #1 seeds vs #8 seeds), then I might get more excited. p.s. 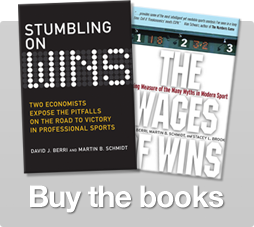 who’s going to be the first sports economist to do the same analysis for baseball? football? international soccer? I scanned the paper and some of the articles. Maybe I missed or forgot something but I’ll make two points and ask if I am wrong for somebody to correct me. 1) We are told the books try to draw even money for protection. But what if no matter what they do the money comes in heavier on the favorite and they try to use that knowledge to gain a little more profit by shifting the line in the house’s favor under this circumstance? 2) Even if the line is perfect it would seem likely that as the point spread gets higher that the probability of over is more than under and the differential increases with the point spread? Just on the math of the game, in addition to effort falloff or impact of garbage time? oops. make that the probability of over is “less”. Certainly for evenly matched teams a 15 point victory is somewhat less likely than a 13pt one (if the line was 14). I think garbage time, especially in high spread /uneven opponent situations can generate this twofold outcome as favorites play the bench or an underdog, down and not expecting a comeback, really experiments even more than usual or goes to garbage time mode even earlier than other teams would or just shows lack of poise and the results of frustration knowing more than anyone else in similar time & score they have very little chance to win. Informed bettors can try to exploit biased opening lines but do they completely and efficiently? I havent read the literature on that. Bettors are aware of garbage time but because it produces two tails, smaller favorite victories and bigger underdog blowouts I dont see how they can act efficently on that general information. If bets taken are uneven and moreso in one direction stably then that would seem to “require” action by the books. Unless the books reveal their internal business I dont think a study can produce sound conclusions or even good guesses. Further on garbage time subject, how coaches coach to the point spread? They want to win by what was expected generally I would assume but does the losing coach “sweat” and persevere the fight over the last 4 points more than the winning coach? I think so. But not always, not completely predictably. Any of these suggestions sound right & significant to those better read or more expert? Abbott says in the comment section: “A lot of you are missing a key point here: if teams are consistently falling short of the spread in these kinds of games, the spread would adjust. It is one of the most efficient markets in the world. Not necessarily. What if the informed bettors and the books were both making money via this situation but the more uninformed were on the other side losing? In that situation the books and the informed bettors could either let it ride that way and both win to a degree or offset each in impact and end up partial winners. Very interesting stuff. I can’t say that I have invested enough time to fully read through the senior thesis or the Wolfers paper on the NCAA point shaving but I have the following immediate reaction that I haven’t find an answer to (it might have been brought up already). I do wonder a bit about the practicality of the players to point shave. Since most of the starters are generally being rested in “garbage time”, would we expect that it’s the second stringers/end of the bench guy (who might have more financial incentives to point shave) that are in on this? Their appearance on the court is far from being guaranteed and playing poorly even in garbage time might mean that they get drop from the rotation all together. If we’re accusing the starters, they do often sit for the last five minutes of the game. I have to profess that I don’t know much about betting in basketball. But given how you do expect every NBA game to essentially to come down to executions in the 4th quarter (much less blow outs in the NBA than the NCAA), I would have uninformly believed that big point spread games are quite rare. For all I know, I might be just hiding my head in the sand, but I would like to believe that this might just means that the sport books are inefficient. Noll is a brilliant sports economist as we all know, but Gibbs has done a good job. OLS regressions using probit and logit are great tools, and that’s why I have planned to do the same with my undergrad thesis paper next year.